I previously wrote about assessing fitness and selecting a destination based on terrain, climate, and weather. How far can you go each day? How many days will it take to complete the route? It’s important to answer these questions with confidence. The answers determine how much food & cooking fuel you take, what locations you camp at, and how much vacation time you take. The following determine the distance you can safely hike each day. 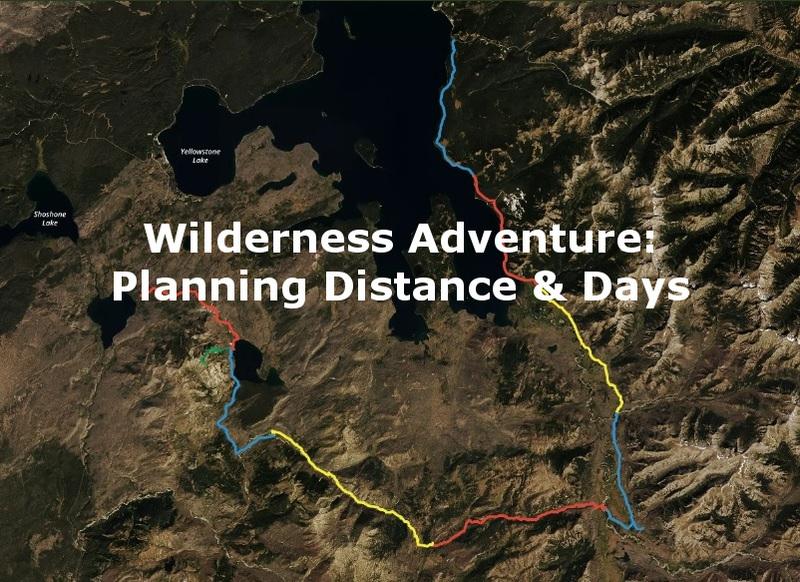 The post image is the route my son and I took through the Southeast corner of Yellowstone in 2016. I used the methods described below to plan our route. The calculations are on the conservative side and worked very well. We were never at risk of hiking in the dark; camping at an unexpected location; or running out of food or fuel. On the fifth day sketchy water crossings delayed us by about three hours. Thorofare Creek wasn’t just a creek and The Yellowstone River, well you get the point. We arrived at camp much later than expected, but with plenty of daylight left. Average walking speed is five kilometers per hour or 3.1 miles per hour. The Naismith’s Rule also estimates three miles per hour and one additional hour for every 2,000 ft. of ascent. These calculations were created in 1892. Few modifications have been made since then. However, professional mountaineers created them for estimating expeditions. They are not accurate for the typical recreational backpacker. They are very aggressive for a new backpacker. Backpack weight, terrain, and an enjoyable pace will slow your speed by one to two miles per hour. I estimate 1.5 miles per hour on relatively flat terrain. This will vary depending on your fitness level. I assume 15 minute breaks every hour. It allows for stops to take pictures and simply enjoy nature. I also add an hour for lunch. If you are hiking in bear country, it isn’t smart to be speed walking anyway. Bears have a sense of smell seven times that of a blood hound, but they don’t see or hear that well. It isn’t difficult to surprise a bear by moving fast and quiet, into the wind. My son and I were making good time when we surprised a black bear at about 15 to 20 yards. It was an intense five seconds until the bear decided to go the other way. Learn your average hiking speed during training. Adjust the rule-of-thumb to match. Your speed will change as your fitness improves. Ascents and descents will slow your average speed. Hiking downhill isn’t always faster. It can be risky to go fast on a downhill trail. You should avoid twisted ankles, hyper-extended knees, and falls when you are many miles away from medical care. Don’t make fast descents a part of your plan. Instead of using the Naismith’s rule and adding one hour per 2,000 ft. of ascent, I add 1 hour per 1,000 ft. of ascent. I think this is more accurate, particularly, for hikers who aren’t acclimated to higher altitudes. Most forecasts for an area will also include the time of the sunrise and sunset for the area. However, I use www.sunrisesunset.com to generate a calendar. They even have a list of more than 100 U.S. National Park locations. Here is an example calculation for a 12-mile day with a total elevation increase of 2,000 ft. If there are 15 hours of daylight I know roughly when I should hit the trail to beat the sunset to camp. I create a route card in a spreadsheet. I either print it and keep it with my maps or I save a screenshot to photos on my phone. I always have the estimated duration of the day’s hike and the hours of daylight. I get my mileage and elevation changes from http://www.alltrails.com/. What are your concerns or comments related to distance planning? “Backpacking Quotes.” Jim’s Trail Resources, March 28, 2015. https://jimstrailresources.wordpress.com/trail-quotes/backpacking/. Galler, Brian, K. “2016 Route Overview.” Brian Galler, January 22, 2017. http://www.briangaller.com/yellowstone/2016-route-overview/. “Walking – Wikipedia.” Wikipedia. Accessed February 27, 2017. https://en.wikipedia.org/wiki/Walking. Excellent info! Just what I need to plan my first multi-day adventure in the mountains next summer. I notice your spreadsheet doesn’t show the 15 minute break per hour, only the lunch hour. Is that already factored into your 1.5 miles/hour number? Thanks. That is correct, the small breaks every hour or so are just baked into the 1.5 miles/hour estimate.